Store Multiple SUPs with Ease. The Freestanding Standup Paddleboard Floor Rack is a convenient way to store multiple SUPs in one compact rack. Made from steel, the rack is strong, sturdy and durable. Its freestanding design is perfect if you can't or don't want to mount a rack into your wall, or if you want a rack to be mobile. While the rack is very sturdy and constructed from steel, it is still easy to move around. This means you could take it to your beach house for the summer, then bring it back home for winter storage! High-density foam padding: The rack arms come padded with a thick, nitrile foam - this is the high-density nice stuff, not the cheap-pipe-insulation-type padding. Rest assured your board will sit comfortably and won't get scratched or nicked thanks to this high quality material! Removable arms: Another great feature about the arms is that they are removable. Attaching and detaching the arms is as simple as a push pin. Additionally, the arms can be mounted upside down or right side up. When mounting the arms right side up, the arm will be angled up 15 degrees relative to the horizon. When mounting upside down, the arms will be angled up at about 5 degrees (almost horizontal). The arms are equally strong mounted in either position, so picking how you want it is simply a matter of preference. Not intended for use in moving vehicles - trailers, campers, etc. Turn this rack into a portable solution by adding this Set of 4 Wheels. Like this rack but need more storage? Check out the Freestanding SUP Rack for 5 boards here. New for 2017: the base of the rack is redesigned as a flat base to increase rack stability and the foam padding has been removed from the base. Length of arms on bottom (floor) level: 20.5"
Hey, guys! This is Mark with StoreYourBoard. With me today, I have with me our Freestanding Paddleboard Floor Rack. This is a great rack option that assembles in just a couple of minutes. It doesn’t require any mounting on your wall or ceiling. It’s made of heavy-duty steel, so it can hold up to 120 pounds, up to three paddleboards. Each level also comes with a high-density premium foam to protect your boards, as well as to provide a nice firm grip. Each level is 11 inches in between, so it should be able to fit anywhere from a center flatwater SUP all the way up to a thicker touring racing SUP. It should be no problem. Each level is 28 inches deep, so again plenty of space to fit even your wider boards, a slight bit of overhang, but it should be plenty to grip nice and firm there. One of the key features of the track is it’s also nicely waist height, so you can load your rack nice and easy specially if you have a larger bulky, heavy SUP. Great if you have multiple boards of different types or if each member of your family has a board of their own. Each level can be easily removed, depending on how many boards you need to store. With a simple push of the locking pin, the arms can come off. Again, high-density foam in both the from and back to protect your board; 28 inches long. You’ll also know that there are two different mounting holes on the back of the arm. That way you can adjust a little bit more of a level shelf look to a more aggressive angle. Again, very easy to load, unload. Great way to get your boards off the floor to prevent any further damage or scratching. Also keeps it nice and accessible for the next time you hit the water. Check out our Freestanding Paddleboard Floor Rack at StoreYourBoard. Easy to build, strong construction and looks good. Great for the outside. Sturdy and the boards are protected. Order came fast and well package. Very easy to install . Good quality. Sturdy but not bulky. Easy to move around. I use it for my kayaks too , it allows easy access to it. it was my second order. Will get a third one in the spring. Perfect ! My boyfriend put this together with me and it was really easy once we read the directions. I keep the stand in my garage and it’s super convenient. It’s sturdy and just the right size. This was even better in person than I expected!! storing 3 boards ranging from 10'6 to 11'4". Easy on, easy off. With the caster set, the rack is easy to move around. This rack has worked out perfect for our needs. 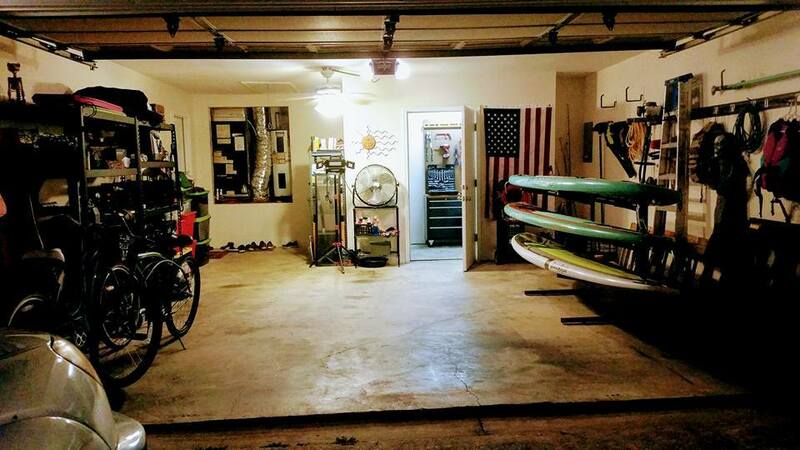 We are able to store two 10'6" Standup Paddleboards on the top 2 racks and a 14 foot Old Town Kayak on the bottom rack. We store ours outside so it is nice to be able to get everything off of the ground. Great product, very sturdy, and we can easily move into storage room in the winter and take up less space. The racks arrived quickly and were easy to assemble. This style rack is perfect for us because we do not have the ceiling height to display boards vertically. As advertises. Boards fit on rack, rack fits in garage well. Helped us organize the space. This rack is WAY better than I thought it would be. I put it together in less than 15 minutes, it is great. I was able to clean up my garage by storing multiple surfboards and a paddleboard on this stand. Makes it very easy to keep my boards nice. It was easy to put together and looks really nice. Just the right hight fit 3 paddle boards and a kayak underneath. Well built and easy to assemble. As good as the product is, the instructions were an embarrassment for an American made product. You were told to use a nut where no nut was required (or supplied) and another part was incorrectly identified. Such an easy problem to fix with the smallest amount of proof reading. Simple to install; stable and does a great job storing boards. Rack just simply works perfect. Organizes our boards and a kayak on the porch in a very pleasing manner. Easy to assemble, stable and room under it for loose items (car roof rack). Very satisfied with the rack. We purchased this Paddleboard Rack to store our boards near our beach. It has worked out perfectly. Easy access and the rack isn't burdensome to move inside for winter storage. Because it is near the water and subject to some high winds we have secured it with some heavy blocks just as an extra precaution. The floor rack arrived very promptly and was very easy to put together (the constructions are not very detailed but you can easily figure it out by just looking at the actual pieces). The stand is sturdy and holds our two boards and a little kids kayak (at the top) perfectly. I have six paddle boards and during the summer they are in high rotation. So having them on the wall in my garage is not practical. The free standing rack has rescued the daily haul. I have one set up outside on the lake and one in my garage. So far we have carried three down for the rack and the the other three are put in the water and off we go. Next up for my house is to order two more and make the outside racks permanent. Easy set up. Took me about 20 minutes by myself. The alen wrench could be tolled in a different way to make it easier to tighten things down, but what's not to love about these racks. This is a nice rack. It holds the weight easily. Looks nice, feels good and solid in your hands. I found the product to be excellent quality and good value for the money. Rack is well made and compact. Installation instructions left a little bit to be desired but overall very pleased with the product. This storage rack is just what we needed. We were unsure whether we were going to store our boards in the garage or outside. This rack gives us the flexibility to do it either way. Ordering was very efficient and the unit was easy to assemble. I would recommend this to others without hesitation. The extra holes were confusing, but otherwise good so far. I can't tell you how perfect this is for our space! We've been piling the boards up under our deck for a few years, not good! My husband searched a few years ago for a rack like this and resorted to asking a carpenter to build one, but nobody ever did. So I finally looked and voila, here it is. We have two paddleboards, a surfboard and a kids lightweight board all loaded on. We love the angled arms so the rain or any outdoor elements will slide right off. Very sturdy too! The versatility of the rack is what I was looking for. It seems very stable. This is nice paddleboard rack that is easy to assemble. The rack is a good working height that allows even my 12 year old daughter to rack her paddle board without to much effort. The store your board unit works well, very happy to have it! My only comment would be that the instructions were not very good, I essentially figured it out myself without them as they were not very helpful. Easy to assemble and looks nice. We will see how long it lasts. We have only had it for a few weeks. It just works. Simple and straightforward. Minutes to assemble. The "feet" make excellent storage for paddles for whatever 3 boards you have on the racks above. Perfect for storing a kayak and up to 2 boards. Will see how durable it is over time but using it in a garage so not too concerned if it can stand up to the elements. Shipped pretty quickly and assembly was a breeze. Placed rack in our old barn on a dirt floor. The floor rack is perfect! Very easy to get SUPs onto the rack and a kayak on the top rack. When we were assembling the rack, we found that there was one piece missing. I called customer service and the responded immediately. I really appreciate StoreYourBoard's customer service! This is a great storage solution. Using it for two 12' SUPs. Fits comfortably in single car garage without taking up much space. Sturdy and easy to assemble. I was thinking of building my own, but considering the cost this turned out to be cheaper and better. Easy to assemble and very sturdy. I put a small 10 foot kayak on the top rack and my boards On the other two. It's great! I've got two ocean boards and one lake board. they all fit on this rack perfectly. and the paddles rest on the feet. have it on the side of my home, about 30 yards from the puget sound (salt water) and surrounded by shrubs. will be interesting to see how it withstands the salty air environment over the next few years. Easy assembly, light yet sturdy build, and holds three big boards. If you have a long center fin it may hit the board below it so it could be a little taller but all in all very pleased with this purchase! I love how easy this was to put together. I agree with other review that written instructions were not clear, but picture helpful and went up without difficulty. It is nice to have a place to store and protect my boards. Simple! Love it--only wish it had foam padding on the uprights, but awesome otherwise! Written by: Susanne j W.
Two 12'6" paddleboards and a kayak fit perfectly on our new holder. Assembly was quick and easy. The rack is stable and keeps everything safe and out of the way. The order process was simple and with free shipping was at our door 3 days later . I would not hesitate to use StoreYourBoard again. I wanted a storage system for my paddleboards and this was the only place I could find one. At the time of ordering it said it was on back order but I received it earlier than expected so that was nice. Paddleboards are so heavy and it would be impossible for me to lift it to place it on a hanging rack. And this way I can always move the storage system if I need to. The product is great. Very happy to finally have my boards stored properly. The only problem was that when it came , there was one rod missing so I needed to talk yo customer service. They were great and mailed out the part quickly. Easy to assemble and holds SUPs and a kayak on top! awesome. Works great. One wrong piece was shipped and they shipped correct part within days. Written by: Michael d. P.
This standing rack seems to be very sturdy, yet moveable, as needed. All parts seem to be of good quality. The written instructions were ambiguous, and I think, inaccurate too. Fortunately, the diagram was clear, so assembly was fairly easy. This product is exactly as it appeared online....and as good as I had hoped. I appreciate the 4 extra bolts and nuts..but was confused as to what they were for..
Easy to build and keeps my boards out of the way. This works great in my garage for our 2 SUPs and 1 surfboard. I like how I didn't have to screw anything into the wall. Seems very sturdy. How much does the rack weigh? I want to make sure it is heavy/sturdy enough to stay intact and balanced along a shoreline that can get windy. Our freestanding rack weighs about 30 pounds. These are very strong racks, and will hold up to 150 lbs. For general use, it is a very stable, sturdy and reliable rack for your boards. For use outdoors, a couple of notes: I would not recommend this rack for outdoor use if your shoreline is on salt-water. However, if you are on fresh-water, it would be fine to use outdoors, but still will weather over time as it is not stainless steel, though it has a protective coating to prevent corrosion. Regarding your winds, this rack should be fine in normal conditions, but for extremely high winds, you may want to add some balast/weight for extra stability. Can this rack be left outside for the summer? Our freestanding SUP rack can be used outdoors, depending on where you live. It is not stainless steel, so it is not rust-proof, but it is treated with a rust-presentation process that will extend its use outdoors in many areas - mainly, if you are not on the ocean, this is a stand you can use outdoors. If you are on salt-water/near he ocean, we would not recommend it for use outdoors, as it will weather quicker in areas where it would be exposed to salt water/air. You can find more options for outdoor use, sorted by salt water & fresh water locations, here, and we have some guidelines for choosing outdoor SUP racks here. Would a Kayak fit on the very bottom of the rack with three paddle boards sitting on the three arms above? This freestanding SUP rack is not going to be a good bet for kayak storage, and a kayak is not likely to fit well or at all on the bottom base level. You might be able to store a slim kayak on one of the rungs, but it isn't guaranteed to work well or at all for kayaks. For storing both SUPs and kayaks, this freestanding rack might be a better option, this freestanding kayak rack. I have 2 SUPs and 2 kayaks. I need a free-standing rack that can go flat against a wall. I can stack the 2 kayaks on top of each other on the bottom and need about 30 inches of clearance. Then the 2 SUPs can go on the bars above that. Which of your racks do you recommend? Since you say you need a one-sided rack, to be used flush against your wall, it narrows the recommendations down, for your 2 SUPs and 2 Kayaks. Thisfreestanding rack could possibly work as you pictured. Its not really designed for kayaks, but the arms can be placed in one of two orientations, to allow more room between levels, and can also be removed. So if you could fit your kayaks as you thought, stacked on bottom level, and removed the first level's arm completely, you would have about 28 inches total of space between floor of rack and 2nd arm level. You then have the top two rows for your SUPs, as you thought. The bottom/floor of rack has arms that are 20" long and angle up a little, so you might want to look at how wide your kayaks are in what your picturing for how to use a rack like this. There is also the taller 5 SUP version, with same types of arms that might give you a little more play for using it for your kayaks by removing a couple of the arms. A few of our other freestanding choices for a combination of kayaks/SUPs extend in both directions, so wouldn't be flush against the wall. One option would be a version of this 3 kayak stand, which comes as listed with arms for kayaks, but a combination of kayak arms and flat SUP arms could be special ordered, to create a rack that would hold your two kayaks and two SUPS. I have a fishing SUP that is 12' long and 36" wide. Will it fit on this unit? I understand the height of the rack is 39.75"; however, what is the height of the top crossbar? The top crossbar on ourfreestanding SUP rackis approximately 4 to 5 inches from the top of the rack, so at about 34" to 35.75" height. Will your standup paddleboard storage rack with three spots work for two boards on the lower spaces and a Dagger Redline on the top space? Whether this could work for your Dagger Redline will depend on its specifications (size/weight/length). The total weight this rack can hold is 120 lbs, with no more than 40 lbs on each level (to distribute weight properly). So you want to think about weight. Additionally, if you have a very long kayak, it might not be perfect fit; the arms on the stand are about 4 feet apart, so it wouldn't be recommended for a board or boat that is longer than 12 feet at the maximum, as you want to have about 1/3 or more of the boat's length supported in the middle. 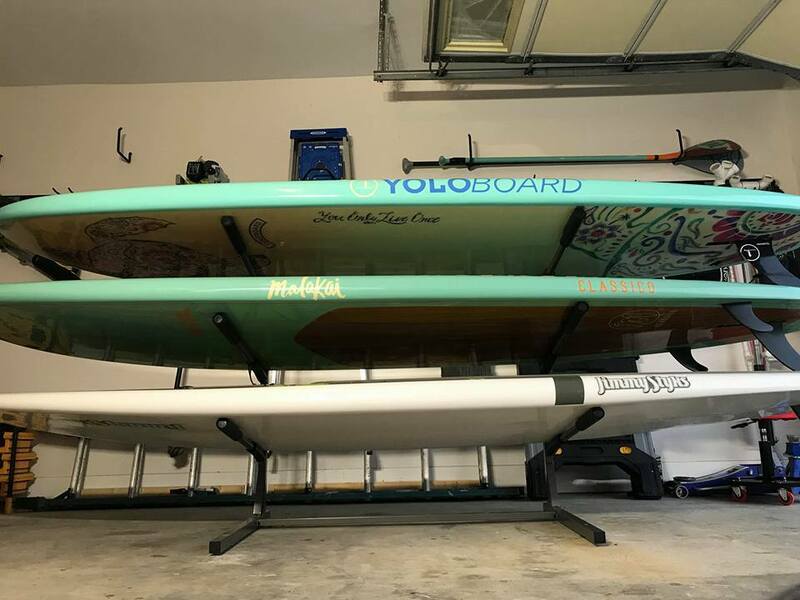 If weight and length is not an issue for your two boards & kayak, you could put the kayak on the top level - but what you want to look at there is is the width of your kayak. The arms are 27" long, so that will provide enough support for kayaks wider than 27" (same as for SUPs that are wider than that), but if those are really wide boats at their beam, how well it will fit could be a question-mark. Last, the arms are removable, so you could possibly remove the bottom set of arms and place the boat on its side on the bottom level, as a thought. I have 2 Hobie Mirage Eclipse boards that weigh 43 lbs. each. Will each level of the rack hold a board? This freestanding SUP stand can hold up to 120 lbs, but that should ideally be distributed evenly, with a maximum of 40 lbs per level. For your Hobie Eclipses, they are running over 40 lbs, so that would not be ideal as they would be exceeding a maximum and could stress the rack arms. Since its a small weight difference at 3 pounds, one could try it, for two levels, as long as any 3rd board on that rack was not very heavy so you weren't exceeding the total weight maximum for the rack system -- but I couldn't guarantee you would not run into a problem if you exceed that 40 lb recommendation per level, and I would be concern it could stress the rack arms a bit. I plan to place the rack in my closed garage where I live on an ismus extending into the sea. The weather is from warm to hot year round. Please tell me what to expect for durability. I rinse my board with fresh water after each use. Part of the reason I like this rack is the design is easier for board access in a garage than the indoor/outdoor freestanding racks. Can you tell me about the coating on the metal? Also, once the arms are changed, how far away from the wall would it be? This 3 board free-standing rack has a rust-and-corrosion prevention coating on it, similar to powder coating. That coating will not prevent rust or corrosion if you are in a salt water environment and used it outdoors, however. 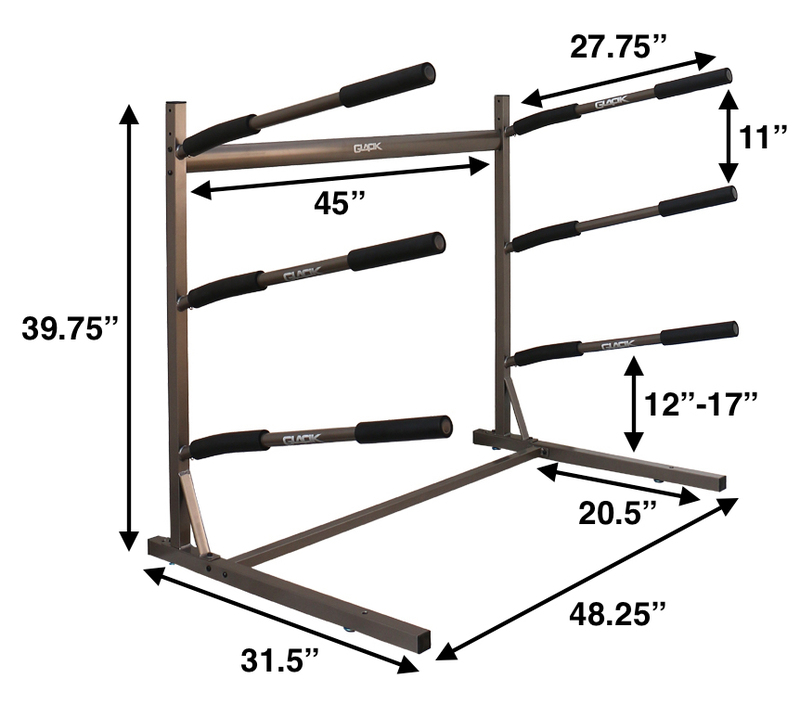 As far as the arms - at the 5 degree position, the arms are almost horizontal, so extend 27.5" away from the wall (though the base of the rack extends 31.5" total away from wall). When you place the arms at the 15 degree position, you will have them angled upwards a bit, so it will be less then 27.5" away from the wall by a few inches (so about 24 or so inches angled away from wall). My SUP board is 12' 6". Would it be too long for this rack? This 3 board freestanding rack can work for boards up to 14' long, so your board would be fine on it! Do these have screw holes at the base, so you can secure them to the floor? This is for an outside dock. No, there is not way to attach this freestanding SUP rack to a floor/surface. It is a more expensive system, because it is stainless steel, so can be used outdoors in saltwater areas -- but this customizable dock rack requires that you attach it to the dock, it is not freestanding, so that may be an alternative to consider. Will this hold 3 SUP's 14"?? example infinity board, starboard, etc...?? Yes, this 3 board stand can support 3 large SUPs! It does have a fixed width, of 48.25", or a little over 4 feet, so for a very long board, 4 feet of the board would be inbetween the arms, then, the rest will be extending over each side... so for your 14 foot long boards, 5 feet will be hanging over each edge, and 4 feet will be in the middle. That is fine though, that distributes the weight/length evenly enough it works. The only other thing to keep in mind is weight -- the board rack can hold up to 120 pounds, but you really don't want to put more than 40 lbs on any one level, again, to keep it evenly distributed. Other than those notes, it does fine holding large boards, and there is a bunch of room between levels for thick boards.